Want to succeed with your fundraising?! Then you need to pick the right ideas! 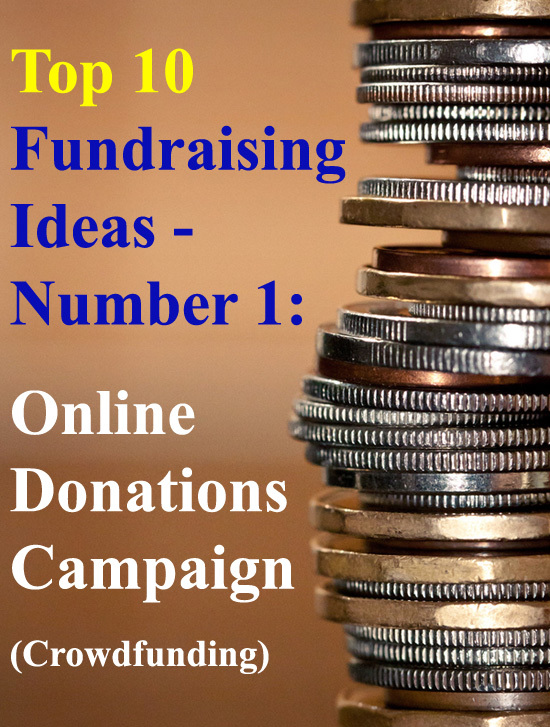 And in general, the following are the TOP 10 Fundraising Ideas to use! The ideas that will help raise you more. You'll find a few quick and simple ideas. But mostly all are big funding potential ideas. All these ideas have been used successfully by thousands of people and organizations. That not every fundraiser will be perfect for you and your organization. You need to think carefully about what would work best with your members, supporters and potential supporters; before starting a fundraiser. I'd recommend you read through as many ideas as possible, and use the idea/s that best fit your cause! The following ideas should not be replacements for your fundamental fundraising strategies that you have in place. Or that you should have in place. Read the Charity Fundraising Ideas page for more great info and resources on these ongoing fundraising strategies. For most groups and causes this would be the first recommended fundraising idea. It is without a doubt the simplest and quickest method of raising funds! Signup and setup an Online Donation page on a Crowdfunding platform. Write a killer fundraising request pitch. That connects readers emotionally to your cause. They must feel MOVED by your cause and trust that they'll be making a difference by donating. Include a Video (and some great images). Stats have shown that videos greatly increase your crowdfunding success. Make sure that it's short, sharp, and once again connects emotionally. And then you must PROMOTE effectively. The more eyeballs on your fundraising page, the more donations you shall receive! Remember - IT DOES TAKE A GOOD STRATEGY TO SUCCEED THOUGH!!! ...To make sure that you actually DO get funded, and are not another "No Funds Raised" statistic! To get started, SETUP your online donation page here for FREE. Our number 2 of these top 10 fundraising ideas is in fact a brilliant combination of the above idea and number 7, Apparel Fundraising. And it's proving exceptionally effective and successful! It is essentially a Crowdfunding Campaign but with the focus being on selling custom "cause" T Shirts. Which provides an added benefit and extra motivation for people to support your cause! But unlike conventional T Shirt fundraising, the Crowdfunding Platform takes care of all the hassles - Payments and donations, printing shirts, and shipping. And it once again doesn't cost you a cent. It is Risk-FREE and Hassle-FREE. But just make sure you design AWESOME T shirts. Signup for free and get started here. A raffle is a fundraising idea that will be effective under almost any circumstance - you just have to sell tickets. ***Check out all the Raffle Ideas here. You should include a raffle in all your events and consider holding a large non-event focused raffle once a year. Just always make sure the prizes are really great! Or if you can't get prizes use a simple 50/50 Raffle, where you split the cash raised between the winner and yourself, 50/50! Click here to read more about successful Raffle Fundraising. These type of fundraising events are PHENOMENAL. Because their fundraising potential is exponential. Each (P)articipant individually takes pledges (raises funds) for your cause. The more participants - The more funds you can raise. Plus the more Pledges Given each Participant can acquire (PG/P) - The More Funds Raised. Pledges are given based on the amount of units completed (UC). For example: $1 for every mile walked. The more units completed - the more funds you can raise. And you can set the pledge amount, or let the donors decide. But either way... The higher the Average Pledge Amount (APA) - The more funds you will raise. So for example: If you had 40 participants who each (on average) took 10 pledges of $1 for every mile completed, of which they all completed 10 miles. You would raise $4000. But if you were able to increase each of those factors by 50%... You would then raise $20,250. What if you were able to triple each of those original numbers. 120 Participants. 30 Pledges each at a $3 average. And 30 miles completed. Now you will raise a brilliant $324,000. Are you starting to see how incredible the exponential fundraising potential is, that pledge events hold? Small increases to each factor, make huge differences to your final funds raised! What Pledge Events are Great? 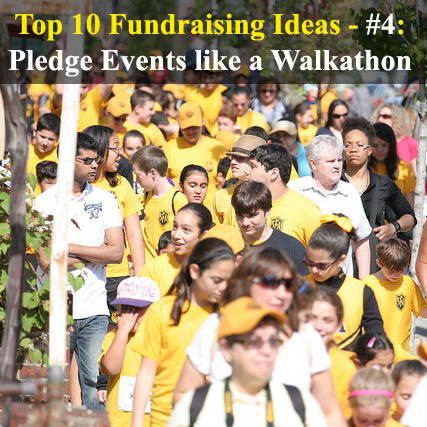 Another great event that fits perfectly into the Top 10 Fundraising Ideas. A golf day is a great way to raise a large amount of funds, and to also raise good awareness for your cause! Be warned though that it does take a fair amount of work and organization to run it successfully! Click here to read about golf fundraising ideas. 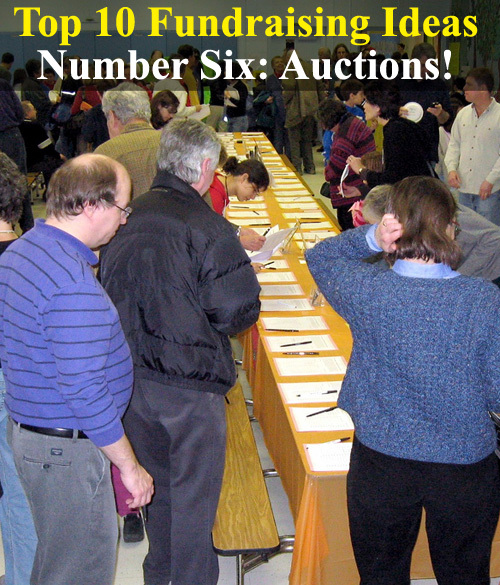 Just like a raffle, Fundraising Auctions will fit perfectly into most fundraising events... But, can also be run on their own! It's a fundraiser that many causes and Nonprofits use extremely successfully and raise huge funds from! Or even a Charity Car Auction! It is definitely, without a doubt, one of the top 10 fundraising ideas you could use! Most groups (especially schools, churches, bands, etc.) should be using some form of Apparel Fundraising. It is such a brilliant fundraiser that will bring in continuous funds and sustainability to your fundraising. It's a fundraiser that your members will be passionate and excited about. It will also raise more awareness for your cause! You can sell the Apparel from your thrift shop, at all your events, by word of mouth, and also online through an Online Apparel Store. Simply put, Cause Marketing is a partnership between a Nonprofit and a For-Profit that is mutually beneficial. It is definitely one of the top 10 fundraising ideas available and has huge fundraising potential. For more info on Cause Marketing and the different methods available, read this great guest post by the Cause Marketing guru, Joe Waters. Or check out his book, "Fundraising with Businesses: 40 New (and Improved!) Strategies for Nonprofits." This is a cheap fundraising item that is very popular and will always sell! 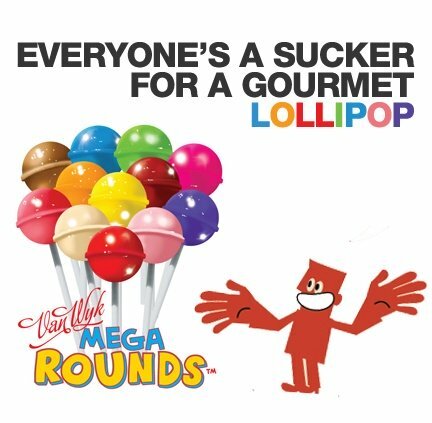 Lollipops are one of the last Top 10 Fundraising Ideas, but they could quite easily be one of your most successful fundraisers. Sell them on their own. Or add them on as another option to other product fundraisers, like cookie dough, and watch how quickly they sell. Click here to read about lollipop fundraising. And if you want to find out what fundraising products are currently popular and profitable, grab this FREE fundraising info guide. This is such a fantastic fundraising idea! People simply love discounts and if they can get discounts to shops that they like shopping in, they are immediately interested! It's what I call the Win-Win-Win Fundraiser. You win, the Customer wins, and the Shops also win! Click here to read about Discount Fundraising Cards. 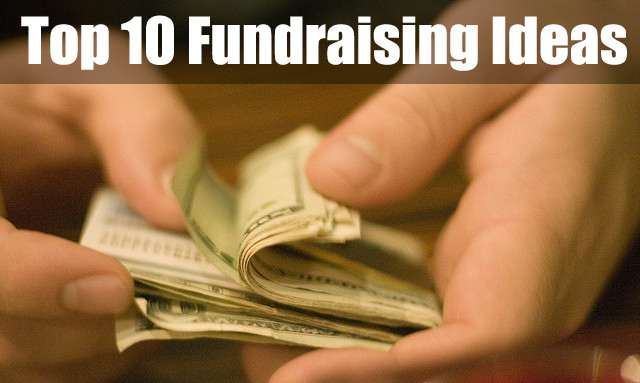 For ideas on how to promote any of these top 10 fundraising ideas read here. I wish you all the best of luck with your fundraising.